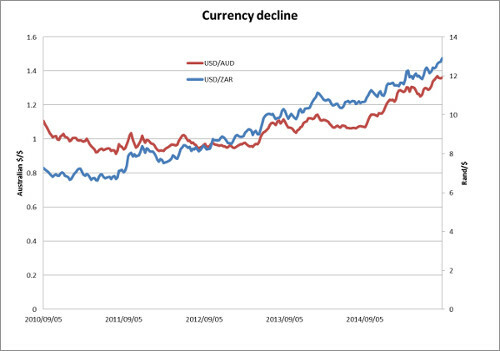 For those who see conspiracy in the steep plunge in the value of the rand against the US dollar, the graph below showing the decline of the Australian dollar can only mean a similar conspiracy against the Australian currency. If you don’t believe in conspiracies — which is not the same as acknowledging that traders backed by massive amounts of money can bring about a currency’s decline by betting against it — you can see the currencies of all commodity-dependent countries are in decline. The graph of the Australian dollar-US $ rate closely tracks the rand-dollar rate. Australia weathered the 1998 Asian crisis better than we did because its central bank did not intervene to try to prop up the value of the currency. Then Reserve Bank governor Chris Stals was accused of doing just that, running up a huge external “forward book” of more than $20 billion, though he told me that the bank was simply intervening to provide liquidity. The Reserve Bank will not make the same mistake again, as Business Day columnist Hilary Joffe pointed out recently. But didn’t we want a weaker currency to help make our exports, particularly our manufactures, cheaper? Well, yes, but not when world financial turmoil once more threatens. It’s no use having a good price if no one is buying. According to the Financial Times, world trade prospects are not good. On the other hand, having a weak rand-dollar exchange rate does mean that the commodities we export automatically garner more rands for every ton sold. It would be disastrous for struggling mines if we sold less platinum and got fewer rands for each ounce sold, for example, which would be the case if the rand-dollar rate was static and the platinum price fell thanks to lower demand for the metal. The biggest plus should be that the weaker rand makes imports more expensive and spurs import substitution, cutting the trade deficit. That involves some suffering, however, because some things we just cannot make here. The middle class will just have to hang on to their current iPhones a bit longer. And I have already switched to South African-made pasta, though the fact that the imported products no longer provide competition means that prices of domestically produced goods will also rise. Stals in 1999 also raised interest rates sharply. He was criticised for that too, as was the Reserve Bank for its recent rate rise. Inflation induced by the fall in the rand and subsequent resentment if the Bank does raise interest rates again will test the Bank’s resolve on inflation-targeting. A journalist for more than two decades, Reg Rumney has just returned from Grahamstown to Johannesburg after spending more than seven years at Rhodes University, teaching economics journalism. He is keenly interested in the role of business in society, and he founded the Mail & Guardian Investing in the Future Awards in 1990 to celebrate excellence in South African corporate social responsibility. Most recently, as executive director of BusinessMap, he was responsible for producing reports on foreign investment, black economic empowerment and privatisation, and carried out research work in Africa on issues related to the investment climate. He writes on, amon other things, foreign investment and BEE, focusing on equity transactions.